Constructed in 1851, St. Paul's Episcopal Church was designed in the Gothic Revival style by noted architect Richard Upjohn. The tower spires were completed in 1870. The Guaranty Building was completed in 1896 and designed by renowned architect Louise Sullivan. 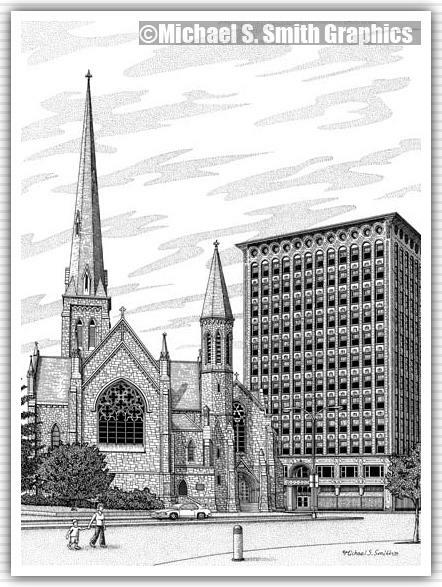 One of the first steel-supported, curtain-walled buildings in the world, it was the tallest building in Buffalo at the time. The name Guaranty comes from the name of the Chicago construction company that built the structure. It is also sometimes referred to as the Prudential Building after the insurance company who refinanced the property in 1898. Both of these structures are on the National Register of Historic Places.